Orange is a combination of red and yellow. Red is filled with energy and stimulation, and yellow is responsible for the happiness and cheerfulness. It is a more active color because it makes us react by gut feeling, and we feel at that particular moment. It is the color that gives you shelter in though moments, by not allowing you to sink into grief or disappointment. It brings a high degree of positivism, always rejuvenating us in the most difficult moments. The great and invigorating benefits of the orange color should be used every day, even if it is just a small object, like a mug or a pen, which we use in our daily tasks. It is a color that will always help us look on the bright side of things, even though reality is often not too bright. For instance, it can bring us encouragement and motivation in our tough financial periods, giving us the power to keep going until we manage to find solutions and improvements. 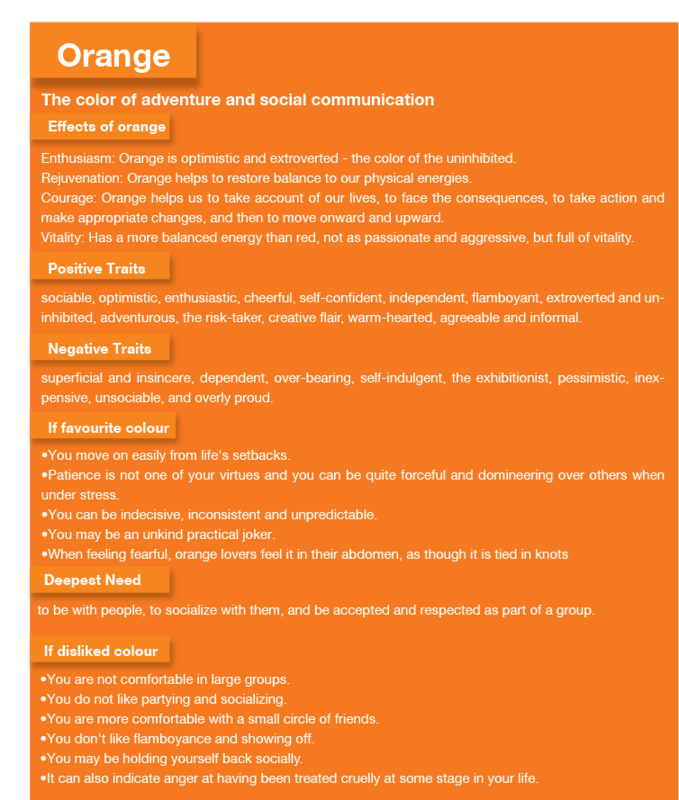 Orange is a very social color, making people open up and enhance their communication. It is a very inviting color, so it is great if is used as a decorative color for parties, as it gets people talking and inspires a good mood. To make a dinner with family, or with friends, more pleasant, use lighter shades of orange to decorate the table or surroundings. If you didn’t know, pastel orange shades would increase the appetite. So you will end up having a great time eating, drinking and talking. Thus, it isn’t the best choice of color for your kitchen if you are trying to go on a diet. It is an excellent color if we want to learn new things and look for new ideas. It lifts up our personal limits allowing us to assimilate more and develop. It also gives us a greater self-respect and the impulse to respect others. The positive traits given by the color are optimistic, enthusiast, sociable, self-confident, flamboyant, adventurous, inhibited and agreeable. Among the negative traits of this color are exhibitionist, superficial, inexpensive, dependent, unsociable, or too proud. It is great for bonding groups and increase your social interactions. It can also encourage a divorce, from the point of view that it helps people move on and leave behind a life that was unsatisfactory. It represents the new beginnings. If we are to take the shades of orange, each one has a particular meaning. Peach color is excellent for communication, influences good manners and calms down. Golden orange represents vitality and self-control. Amber helps the confidence and self-esteem, but it can also give a degree of arrogance. Burnt orange is the color of aggression, pride, and tension. Dark orange the color of the advantage taker, making a selfish earn out of everything. I didn’t realize that orange was a color that could help you keep from getting down in hard moments. This must be a branch of colour psychology or something like that. There must be a lot that can be done by colors to emotions. Maybe I’ll have to look into it a little bit more. I want to wear a gown in orange color in my graduation, how does it sound? Yes, people dismiss color,sound and smell as “Yeah Right” Just think of a fast food restaurant, most if not all are bright yellow/red. Blue and green……I cant think of any off hand. Changing to sound look up 432hz and 440hz. It has been awhile so don’t think I’m a loon if hertz is wrong. In a nut shell one # is very soothing to us and the other is nails on a chalkboard to our inner brain that is. I can talk and think better than I can put on paper, if this is interesting to you you will like the sound information.